From its location deep within the story of the grand Indian epic, to its charming old temples and heart-warming hospitality, Lakhmandal is a must on your to-explore list. About 20 kilometres from the pristine hill station of Chakrata in Uttarakhand, on the other end diagonally opposite to the entry from Kalsi, we hit the dirt road that would take us to the very historic lost city of Lakhamandal — situated on the banks of river Yamuna. The road is moderate in size — neither too tiny, nor of urban proportions — and carved out of the side of a mountain. It moves in an undulating fashion along the natural curves and bends. The drive is sandwiched between the mountainside and a ravenous dip into the valley and is both hair-raising and adventurous at the same time. As is often the case in the hilly terrain of the beauteous Uttarakhand, the drive is the most charming part. The road is dotted with small huts — not a settlement, sporadic huts in ones or twos, sheds for cattle, dried-up trickles of waterfalls — and sudden shacks doling out lip-smacking pakoras and paranthas. There is never a dull moment as you take in the beautiful surroundings of the hills, wave in merriment at the village folk who reciprocate with equal gusto and become an attraction for the mountain kids excited at the sight of urban vehicles and their strange occupants. The pit stops are something to look forward to as you refuel yourself with delectable fare churned out with a lot of pride and attention. While we got to Lakhamandal from Chakrata, covering an 66 kilometres, Lakhamandal itself is 125 kilometres from Dehra Dun via Herbertpur and 111 kilometres via Mussoorie. Lakhamandal is only accessible via road. Dehra Dun is the last station and Jolly Grant Airport in the outskirts of Dehra Dun, the only airport in the vicinity. This means that a trip to Lakhamandal, inevitably, becomes an extended vacation as you cross through at least three major tourist attractions in as many directions of this spiritual spot. Yet another tourist spot is Tiger Fall, about 52 kilometres from Lakhamandal, ideal for nature lovers. Lakhamandal instantly gives credence to the belief that India still presents a magical confluence of mythology and spirituality — just as it surges ahead to chart a new course in a technologically advanced world. At first glance, Lakhamandal can be dismissed as a small village tucked away in the gut of a mountain. But it is when you go further that the historic site unravels its mythological past and spiritual essence. The village is charming, with its stone-topped roofs and houses with exquisite wood carvings. And the people, extremely warm, honest and welcoming. It is easy to befriend these simple folk, engage them in animated conversation about the history they seem to be custodians of, saunter into their houses for a warm broth or a platter of home-style food. These people are proud of their heritage, extremely congenial, shorn of urban prejudices and honest to the core. While walking through this quaint region, we forgot our handbags with our cameras, mobiles and wallets, in the main temple complex for a good hour or so. A shocked realisation led to a frantic search before we reached the spot where we’d left our bags — it was a big relief to see them untouched while unmonitored for all this time. Definitely a rare phenomenon in India’s other tourist destinations. We opined that perhaps the influence of the Mahabharata, with its overriding principles of Dharma and Karma, had something to do with the inherent morality in the keepers of its tradition here. Lakhamandal figures prominently in the pages of Mahabharata — one of the two major Sanskrit epics of ancient India. The Mahabharata, as we all know, chronicles the story of the dynastic struggle between the sibling clans of the Kauravas and the Pandavas for the throne of Hastinapura. There was intense enmity between the Kauravas and the Pandava brothers, from their youth, well into manhood. Legend has it that the Kauravas ordered a Lakshagriha (House of Lac) to be built in order to burn alive their cousins, the Pandavas. The Pandavas, however, escaped unscathed, aided by Lord Krishna. The Pandavas escaped by digging tunnels with the help of a miner. There are a number of cave formations near Lakhamandal. It is believed that the Pandava brothers took refuge in these caves. You can still see the cave openings on the face of the hill range in front of you. If you are adventurous enough to walk through a colony of bats hanging there eerily, you can explore these dingy cavities with the help of a local guide. 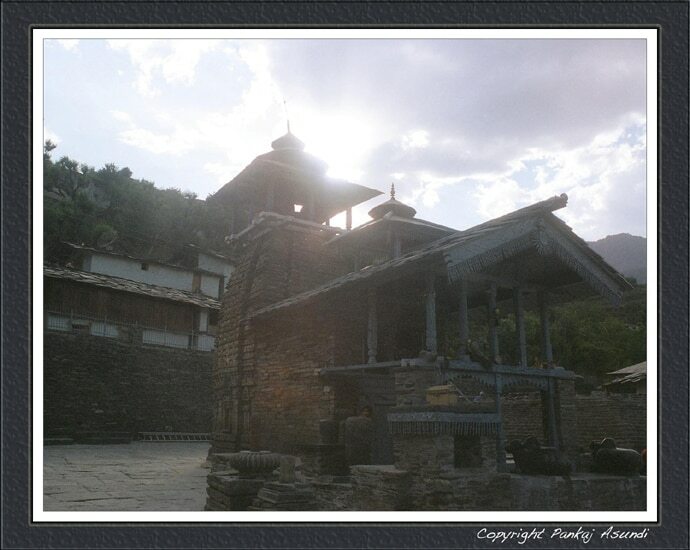 Old temples of Shiva, the Pandavas and Parshuram are aplenty in this area. There is a historic cave and an eighth-century temple with a number of carved stone figures and two big Shivalingas, all of which are of considerable archaeological importance. The temple has gigantic statues of Gods, royal guards and musical instruments cut from large blocks of shining grey and granite-like stone. 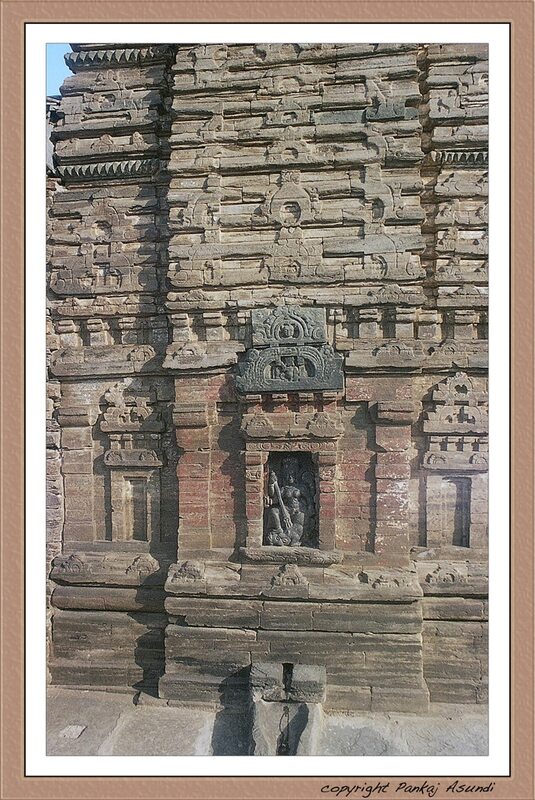 The temple structure itself boasts a fine architecture, decorated with carved figures of gods and goddesses. The figures in myriad poses seem to tell the story of the great epic. Just as you enter the temple complex, you are greeted by the priest who performs the traditional puja for you. There are giant drums atop a loft from where the temple drummer spreads the news of your arrival to the entire region. 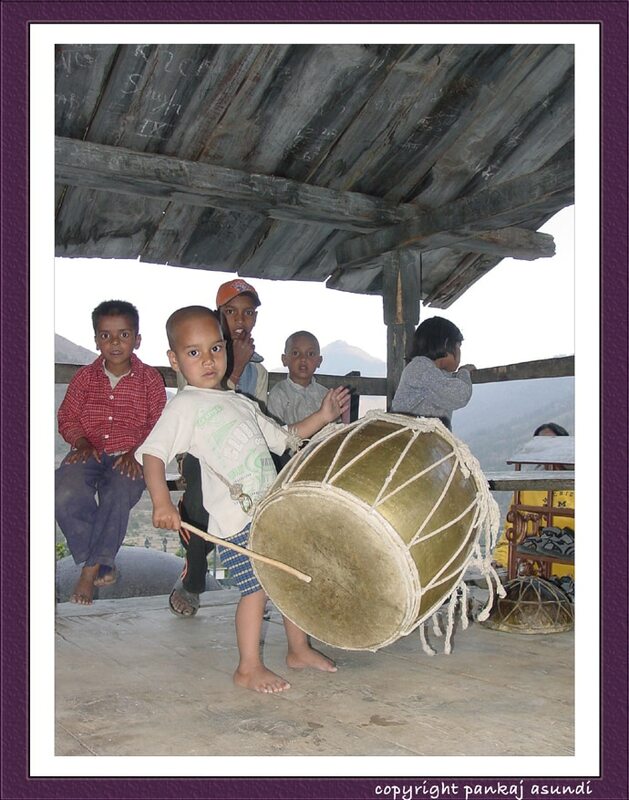 Sometimes, the village kids, tiny in size and dwarfed by the drums but robust in spirit, merrily beat away on the drums in a surprisingly mellifluous rhythm. A local assumes the role of a guide as he walks you through the complex, spanning from the main temple to the area dedicated to the large Shivalinga at the far end. The area falls under Jaunsar-Bawar, a tribal land where people practice polygamy and polyandry, in keeping with the customs of the Pandavas (the five Pandava brothers were married to a single woman, Draupadi). 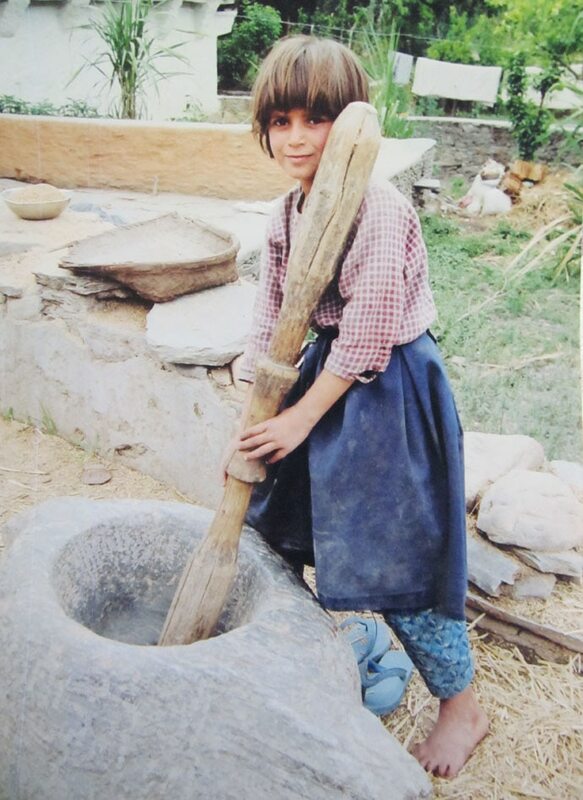 The Jaunsaaris are known for their sharp features, big eyes, rosy cheeks and flawless peaches and cream complexion. Their language is certainly different. And coupled with decidedly different mannerisms of the denizens, this exotic region transports you to an alien land of folklore in an entirely different era. There is a saying in Sanskrit — Atithi Devo Bhava (a guest is God). The people here seem to live this dictum. There are enough invitations that spring up from our new-found friends of breaking bread with them and spending a night under their modest, yet beautifully wood-carved roofs. The people are extremely hospitable. It is quite interesting to watch the villagers go about their daily chores — a young tyke herds his tribe of goats, an elderly man puffs away on his chillum as another sips from an earthen cup, a young girl beats the grain from the husks in a giant mortar and pestle, a group of traditionally clad women huddle away perhaps to share the gossip of the day, but all beam at the sight of the visitors, atithis (guests) for them, and pose for some happy memories. If you visit the historic St. Mary's City in Maryland, USA, you will see that they have created a premier outdoor living history museum and archaeological park, located on the site of the state's first capital and the fourth permanent British settlement in the New World. Within the 835-acre site, visitors may step on board a tall ship, explore a Woodland Indian Hamlet, help Godiah Spray in his tobacco field, tour the 1676 State House and watch the ongoing reconstruction of the original brick chapel. This is a reenactment of 17th century America. Now think about the period of the Mahabharata. Scientific calculations date the Mahabharata war to around circa 3130-3140 BC. Imagine the ancient setting, the mythological legend, the naturally beautiful environs, the mystical caves and the living of its people, and you immediately see possibilities for turning a visit to Lakhamandal into an exquisite and alluring trip. While a quick Google search reveals that there is a Tourist Rest House at Barkot, about 27 km. from here and a Forest Rest house at Kawa, 6 km. away, our local guide promises that there is a very habitable ‘hotel' within the village that would not disappoint us. So, a word of advice is to go with minimum expectations in order to enjoy the unpretentious, yet clean hospitality. The places around Lakhamandal are as pleasing, making the region a nature lover's delight. You could drive to Bernigaad and continue the journey to Nowgaon, a small town about 12 kilometres from Bernigaad that offers the best view of the Bandarpoonch Peak (6315 meters) — one of the prominent peaks of the Great Himalayas. Or move onto the Purola/Jarmola regions through one of the most beautiful pine forests in Asia, with spectacular views of the Purola valley and the Kedarkanta Peak (3813 metres). And just 16 kilometres downhill, through pine forests and apple orchards are the village Mori, the gateway of Tons valley in north-western Garhwal — and purportedly the legendary realm of Duryodhana himself. Seasoned PR & Communications Expert, Poet, Hospitality Feature Writer.